I am excited to start sketching and drawing more and share my process! I love work in progress pics because it is fun to see the sketch and then the finished product! Make sure to check back to see if this will be an exclusive club digi for March or just a regular digi in my Etsy shop. February 2 Cute Ink Club Digital Stamps. 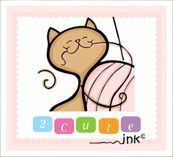 If you have not joined the 2 Cute Ink Digital Stamps Club yet, you must give it a try! This months club exclusive designs are extra cute and I had such a fun time drawing them. Remember it is only $5 a month to join the club!